After shifted to my current location and close to my native house in Adyar, Chennai, I chose to go to our family doctor for the check-ups in my wheelchair rather taking the car since the clinic is about a km from home. But the only difficult I face during this course was crossing the LB Road, the main road that connects Adyar and Thiruvanmiyur signals. Though there was a zebra crossing and separate signal for pedestrian to cross the road (near hotel Lakshmi Sagar), it wasn’t literally difficult, but until only the signal works. 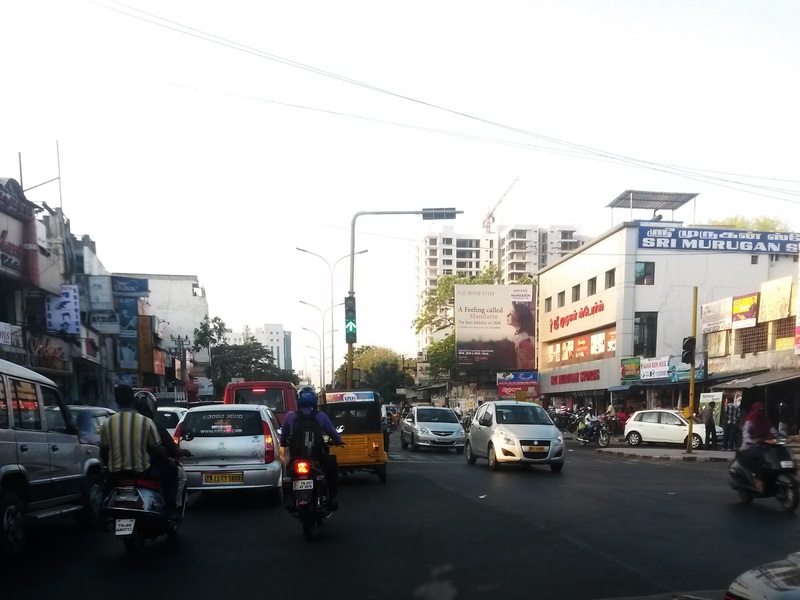 The signals flashing orange (which means cross with caution) is a common one in the cities at night and it usually take place only after 10pm when the traffic comes down, but when it happens as early as 9 pm (which is also a peak hour in cities like Chennai) crossing the road is a challenge. Some vehicles stop to give way when seeing me in wheelchair to cross the road, but we can’t expect the same compassion from public buses and bikes. They kept moving even the signal turned red really scare me to cross and travel aside the road. My cousin brother used to come along with me and when the signal shut down he blocks the vehicles to let me cross the road. For me it shows the irresponsible and laziness of the traffic police to shut down the signal when there was still heavy traffic. Other day I was close to the signal and before I cross it turned flashing orange and vehicles started to cross from all directions turned to be difficult. I notice to amaze the signal next to this was working and regulating the traffic and here we are in trouble crossing the road. The traffic signals are automated and I don’t find there could be any difficult for the traffic cop to regulate but still switching off only sends frustration. oh, do be safe! too much traffic there! Oh dear, I hope your obstacles in crossing will be solved soon. I believe you don't need to visit the doctor on a weekly basis. I cannot picture the location well but was wondering whether the car could stop right outside the clinic for you to get down first. Good luck Jeevan and Happy Weekend! A lot of traffic and no signal is not good! Twilight Man - Yes, unless I have trouble with health I don’t need to visit doctor… but no worry my friend, the clinic is not on the main road. It’s little by road from there. And I avoid the car only because to avoid stress getting in and out of car for a place less than a km. The attitude of drivers is to be blamed. Many don't even give way for old people to cross the road. But a very few stop and make others stop so that people can cross the road. I hope our society doesn't become totally insensitive. I can only imagine how difficult it is to get across a busy street in a wheelchair. It is often difficult (and dangerous) for people who can walk and run to get across heavily traveled city streets. Please exercise some caution, no point depending on signals.